ANN ARBOR, MI – 14 September 2017 – Phrixus Pharmaceuticals, Inc. (“Phrixus”), a company focused on therapies for Duchenne muscular dystrophy (DMD) and heart failure, today announced agreements with several DMD patient organizations and Cincinnati Children’s Hospital to conduct a first clinical trial of Carmeseal-MD™’s, active pharmaceutical ingredient Poloxamer 188 NF (P-188 NF), for the treatment of DMD in non-ambulatory patients. A number of endpoints will be evaluated including effects of P-188 NF on respiratory endpoints such as forced vital activity and on secondary endpoints related to cardiac and skeletal limb muscle performance. “Older, non-ambulatory patients with DMD have few treatment options, especially with regard to heart failure and respiratory dysfunction, the two leading causes of death. Therefore, they are in urgent need of additional therapies that can slow or arrest disease progression,” said Dr. John L. Jefferies, Director, Advanced Heart Failure and Cardiomyopathy, Professor, Pediatric Cardiology and Adult Cardiovascular Diseases, The Heart Institute, Professor, Division of Human Genetics, Cincinnati Children’s Hospital Medical Center, who will be the Principal Investigator. Carmeseal-MD is available outside of the United States through Phrixus’s Expanded Access Program and Ethicor Pharma Ltd., a distributor. For more information, please visit www.ethicorpharma.com or contact enquiries@ethicorpharma.com. ANN ARBOR, MI – 13 September 2017 – Phrixus Pharmaceuticals, Inc. (“Phrixus”), a company focused on therapies for Duchenne muscular dystrophy and heart failure, today announced that the first patient with DMD completed 15-month of treatment with Carmeseal-MD. Treatment was well-tolerated; benefits in these patients included reductions in muscle damage markers such as creatine kinase and cardiac troponin. 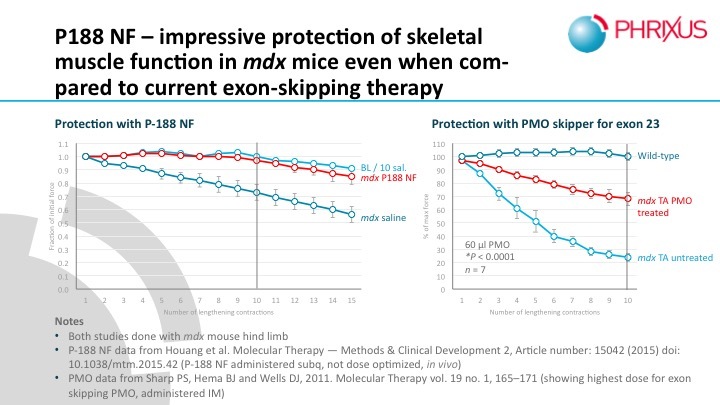 “The strong preclinical data, combined with human safety data from over 2,500 patients in un-related indications creates a strong rationale for using P-188 NF, a membrane stabilizer, in DMD, a disease that is characterized by membrane tears due to the absence of functional dystrophin,” said Bruce Markham, Ph.D., Chief Scientific Officer and VP Research of Phrixus. “Providing Carmeseal-MD as an unlicensed special provides an opportunity for specialty physicians outside of the United States to treat patients especially with regard to heart failure and respiratory dysfunction, the two leading causes of death,” added Thomas A. Collet, President & CEO. Duchenne muscular dystrophy and acute decompensated heart failure. In multiple preclinical models, Carmeseal-MD, also known as Poloxamer-188 NF or P-188 NF, has been shown to seal the tears that characterize cellular membranes in Duchenne muscular dystrophy. Sealing of these tears leads to improved performance and prolonged survival of these cells, which translates into improved function of the heart, the diaphragm and skeletal limb muscle. Carmeseal-MD is under development as a once-a-day subcutaneous injection with initial focus on the treatment of cardiac and respiratory deficits and upper body strength in non-ambulatory boys and young men with DMD.